Is it possible to manage the creative professionals within your organization without stifling them? That’s the million-dollar question for those trying to help their companies develop the kind of breakthrough innovations that result in unique products, improved processes and creative advantages that competitors can’t copy. The challenge lies in striking the right balance between unleashing your creative people’s energy and channeling it into tangible business results. Drawing on Lina M. Echeverría’s considerable experience assembling and nurturing cutting-edge teams at Corning Inc., one of America’s leading technology companies, Idea Agent shows you how to become an Idea Agent –– a catalyst for releasing your people’s creativity, their advocate within the company, and also the person who keeps them focused and productive. 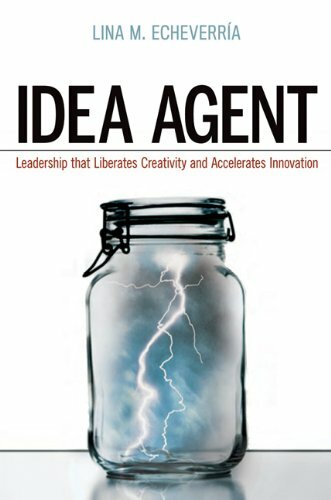 Containing practical methods for pulling strong-minded, visionary individuals together to solve incredibly complex problems, Idea Agent reveals seven proven principles to help you nurture –– and follow through on –– innovation. An impassioned culture of innovation thrives when guided by leaders who can resonate with team members –– leaders capable of managing with passion and creating energized organizations while staying true to themselves and making their own work meaningful. Innovation thrives under a leader who internalizes and lives by the belief that to excel you must start with a group; to excel you must create a culture; and to excel you must manage one by one –– one person at a time, one situation at a time, one project at a time, one group at a time –– by staying in the present, undistracted. These seven elements are not unarticulated components; rather they come together to make up a living system whose energy radiates from a leader at the core, its heart center. As anyone who has been surrounded by creative artists, writers or musicians knows, creativity often comes along with strong — even conflicted — personalities who will not stop in the face of obstacles along their way. The drive to materialize their vision is stronger than themselves. Creativity can be a hot fire and you have to love it to gain from it. Fear of managing the passions of creative scientists will only lead to missed opportunities. Not being afraid of moving to free up and channel the energy and the creativity, on the other hand, can open worlds of opportunities. It cannot be stressed enough: it is about understanding each one of the players for who they are, where they come from, what drives them and what they can bring to the solutions. And from this understanding, leadership that liberates creativity is about managing conflict — not preventing conflict from arising, but stepping into the ring of fire and managing all its actors and stages. Leading a creative team means harnessing this conflict and managing it to benefit, not detract from, the work. You will have divergences, clashes and tension. Perhaps the level of control in your organization is high enough that the dissent is being discouraged. But then so are the good ideas, the ones that come at a 90-degree angle from your planned path. An understanding of each human being and the way he or she relates to others needs to be your guide. As a leader, it starts with you knowing your people, their reactions and expectations, their roles in the team. It continues with being comfortable with conflict and with understanding that arguments and discussion are as essential to science as experimentation itself. And it moves on with playing an active role in managing conflict, literally sitting at the negotiating table, rather than shying away from it. The first step in building a high-performance team is to get passionate, brilliant and creative people in the room. Beyond stellar academic or work credentials, it is essential to get a sense of the candidate’s fit with your organization by looking for the person — his or her upbringing and personality, ability to see wide open spaces balanced by the need to remain highly focused, life at home and in the community, and reaction to those circumstances. Just as crucial is the need to look outside the person’s work life for expressions of creativity, such as hobbies, activities and a zest for life. As with living your values and with everything you do, in inspiring a spirit of high performance and demanding excellence, as a leader you need to guide, direct, coax, detour and show the way. And to do so, you need to lead by example. There are two critical elements for success in bringing out the spirit of high performance in your group. First, expectations must be clearly spelled out, not just on your first day as a leader but for every single assignment, project and suggestion. The second element is, naturally, consistency –– though not rigidity –– in upholding your expectations. Your expectations may be nuanced by the people, the circumstances and the activities they perform, but your expectations, like your values, should not be accommodating of personalities –– true for some but not for others. At the core, the leader needs to offer unconditional support and deep interest in the careers of practitioners in such a genuine way that it underlies and permeates each action and is deeply felt by everybody. To excel in breakthrough innovation, it is not enough to manage a group of talented individuals. It starts with survival of the culture, and to survive a leader must create a culture defined by beliefs, attitudes, energy, interaction style and practices — and rituals. But to excel, the leader must ensure that the culture be one of creative engagement and liberating values. If it is clearly defined and rests on lived values, the group culture will flood the larger organization and, in so doing, create the network that is vital for innovation to take place. By defining a clear organization, the stumbling blocks — second-guessing, the fear that “it can’t be done,” risk- averse knee-jerk reactions, circuitous approval paths and many other pitfalls — are eliminated and replaced by a streamlined delivery process. The time invested in defining a structure, with roles, links and responsibilities clearly understood by all, is time well spent. The need to focus on clear organizational structure in no way demands a turning-away from maintaining the vibrancy of an organization, of establishing values, demanding excellence and creating a culture by taking care of your team members one at a time. Just the opposite: Both need to coexist with equal intensity, enthusiasm and rigor. A structure, however, needs to strike a balance between two organizational extremes. On one hand, authoritarian hierarchies impose great clarity on an organization or team, but they can also stifle creativity and passionate exploration. Free-form organizations, on the other hand, provide no boundaries or guidance for unconventional spirits, who often flounder without the structure imposed by a more traditional organization. The need, then, is for a clearly defined impassioned organization where everybody’s role and everybody’s responsibility is clear to all and where every exchange reinforces the role of each component. The more comfortable every member is in understanding his or her role, the less he or she will feel driven to engage defense mechanisms to defend his or her turf. It is this absence of destructive conflict that creates space and liberates passions. To guide intense, high-energy teams, a leader needs to be passionate; impassioned practitioners are naturally at odds with apathetic leadership and the ambiguous results it elicits. But a leader’s passion must be authentic; it cannot be put on or imposed from outside. Leaders need to be true to themselves while carrying out their roles. Following a recipe and going through the mechanics, even if the symbols are there, will neither create a culture nor motivate teams. Ultimately, for leaders to be able to successfully maintain the peak performance that the role demands, they need to run both hot and cold at the same time: impassioned and detached. The passionate, energizing aspect is key to the motivational and inspirational facet of the leader. But it is detachment that enables the leader to guide the raft through whitewater. Detachment arises from awareness of what is really happening, from the understanding that your participation is required, but your control is not. A detached leader can afford to put his or her energy into nurturing, not controlling. At the core of genuine leadership is a clear sense of self-acceptance by the leader, which comes from strong and unrelenting work leading to self-awareness. These two qualities, self-acceptance and self-awareness, are the foundation of leadership as service that is expressed through courage, integrity and empathy toward others, allowing a culture of empowerment to emerge. Self-awareness is an imperative for leadership. You need to discover who you are before you can lead others, before you can help them and before they will trust you. Conversely, the many dimensions and facets of leadership, the many different situations and challenges awakening unconscious conditioning and eliciting emotional responses in you, create an unparalleled opportunity for self-discovery, inner growth and fulfillment. Leadership as service can only come through nonjudgmental acceptance of your whole being, regardless of your behavior and perceived lacks. Self-acceptance brings humility, which in turn frees us from arrogance and the drive to inflate ourselves. Leadership as service flourishes when there is no personal agenda of acquisition, when the leader is free to serve and to lead with the best interests of others at heart, while releasing the need to prove himself or herself to be above or below others.